Posted September 4, 2018 by Dr. Dale Rubenstein. You may think you’re doing your cat a favor when every time she’s hungry and cries for food, you give her more cat food or a treat. Or maybe you just keep the bowl full of dry food all the time, so your kitty can eat whenever he wants. Unfortunately, this can often lead to obesity in your cat. And with those extra pounds often comes various illnesses. Diabetes in cats is a common consequence of “too much love”. 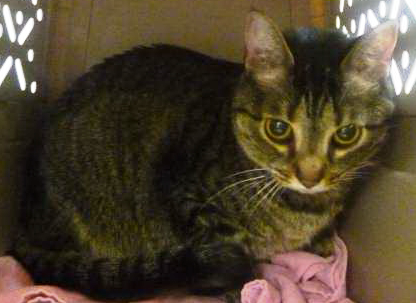 Molly is a super sweet, 6 year old spayed female who had recently lost about 5 pounds. For people, that’s just a drop in the bucket. But for a cat, that’s a lot of weight to lose – almost 1/3 of her body weight! She now weighs around 11 lbs., and actually is at a good weight for her size. However, cats should never lose that much weight quickly. So when she came to see Dr. De Bernardis for a check-up, she knew Molly was a sick kitty. Molly’s owners brought her in because of the weight loss over the past several months. They had been through a stressful time at home, and thought Molly wasn’t eating because she was sensitive to their emotions. Now Molly was eating better, in fact ravenously, but she hadn’t put any weight back on. So they figured they better check things out. Dr. De Bernardis ran a battery of tests, and Molly turned out to have diabetes with ketoacidosis. This meant she had a really high blood sugar level, and not enough insulin (or the insulin wasn’t working properly) to get that sugar into the cells that need it for energy. When that happens, the cells think they are starving. After a while the body starts to break down muscle and fat for the cells to use as energy, and this can cause a substance called ketones to build up in the blood. Normally, you want your body to produce enough insulin to keep just enough sugar circulating through the body to feed your cells. Too much, and it can lead to nerve, kidney, and eye damage. Too little, and it affects the brain. Early on, you may observe your cat drinking a lot of water, when maybe you rarely saw her drinking in the past. Along with that, you may notice the litter box is constantly wet from excessive urination. Frequently, owners report that their cat has lost weight but is always hungry and eats like he’s starving (which, as mentioned above, he sort of is!). Vomiting and a lack of energy may also be noted. But these symptoms occur with many other cat diseases. Not to mention, sometimes otherwise normal cats throw up hairballs. And cats are naturally lazy, right? So often these vague signs might be overlooked as being insignificant. A fairly common complication of high blood sugar in cats is diabetic neuropathy. This is a condition where the increased level of sugar in the blood causes nerve damage. The nerve to the hind leg is most commonly affected. You may notice it looks like your cat is walking on his hocks instead of just his toes. When ketones build up in the blood, they eventually get excreted into the urine. So a urine test is very important in evaluating diabetes. Ketones in the urine indicate a much more severe problem is going on. In fact, ketoacidosis is life threatening if not treated quickly. Cats quickly become dehydrated and may even become comatose. Rapid intervention with intravenous fluids and close monitoring of electrolytes and blood sugar is needed in order to save the patient. So what about Molly? How did Aurora’s Angels Fund help? Unfortunately, diabetes in cats is a very expensive disease to control. The initial cost to diagnose the problem and start treatment is something that most people are totally unprepared for. In a case like Molly, she needed intensive care and overnight monitoring to get her through her ketoacidosis, so that made it even worse. And once the cat has been stabilized, there are ongoing costs for insulin, syringes and monitoring blood glucose levels. Fortunately, with a little help from Aurora’s Angels Fund donations, we were able to help defray some of the cost of the initial work-up. Molly bounced back from her initial ketoacidosis. Although her blood sugar is still not completely under control, it has improved markedly from when she first came in. Her owners are trying to monitor her blood sugar levels at home now, and she is feeling much better. Molly is a fairly young cat to have developed diabetes, so we hope she is able to continue to do well for a long time! If you notice any of the symptoms we mentioned, do call and schedule a check up for your cat as soon as possible. And the next time you take your cat in for a wellness exam and the veterinarian recommends doing some blood work, remember that can be a good way to pick up an illness like diabetes before it progresses to ketoacidosis and requires hospitalization and intensive care.